In a bid to expand its footprint significantly in the state of Maharashtra, CCAvenue.com, India's largest third party payment aggregator, has signed an agreement with Bassein Catholic Co-operative Bank, a top scheduled bank for its net banking option. 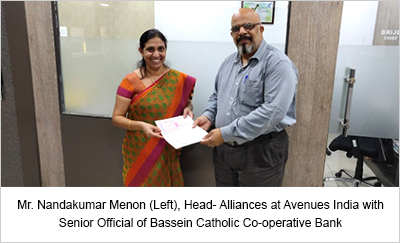 Merchants registered with CCAvenue stand to benefit considerably from the signing of this deal as they can now collect payments for their products and services in real-time from Bassein Catholic Co-operative Bank's rapidly growing customer base. A social reformer Rev Msgr. P. J. Monis along with other social activists established the bank in February 1918 as a credit co-operative society. The aim of the bank was to bring financial freedom in the region of Vasai. The bank has played a significant role in the advancement of the area as it initiated a massive change in the lifestyle, education and financial stability of the residents of Vasai. The total business of the Bassein Catholic Co-operative Bank stood at INR 7702.76 Cr at the end of 2015-16 but grew to INR 9034.47 at the end of 2016-2017, registering an impressive growth of 17.29%. Out of 54 branches, a single branch has crossed the business mix of INR 1100 Cr. The bank's deposits were INR 5567.46 as on March 31, 2017 which was a tremendous growth of INR 840 Cr over the previous year. This tie-up enables the large number of bank's customers to shop conveniently on 1 lakh+ websites powered by CCAvenue by making payments through a direct debit to their account. CCAvenue ceaselessly strives towards widening its payment network and making digital payments more popular and accessible. As more and more payment options are included in its platform, its merchants could harness them effectively and enhance their business potential substantially. Infibeam Avenues Ltd. is India's leading B2B e-Commerce Solutions provider offering end-to-end e-Commerce software solutions through the internet to small and large merchants, enterprises and the government. The Company caters to customers across business verticals and includes many of the most established brands in India and internationally.